When the Dodge V-10 was first introduced, there were two very different versions: the race engine, used on the Viper, and the torque, used on the Ram. A V-10 powered Ram 2500 truck was, in truth, similar in feel to a 318-powered 1500, since it was meant for towing more than acceleration. The newly augmented Viper V-10 is used, intact, on the Ram SRT-10. With 500 horsepower and 525 lb-ft of torque, it is the fastest truck available. Created by the new Performance Vehicle Operations (PVO) team - Chrysler's version of SVO and AMG - the truck used Viper and Prowler engineers along with the teams responsible for NASCAR vehicles and Le Mans Vipers. SRT-10 is based on the standard SRT name given, confusingly enough, to vehicles modified by the PVO Group - that's Performance Vehicle Operations. SRT originally stood for "Street and Racing Technology" but now stands for "Strip, Road, and Track" - similar to the old R/T designation which seems to have been abandoned. Only recently off the Saltillo, Mexico, assembly line and not modified in any way for additional power or enhanced aerodynamics, a Dodge Ram SRT-10 posted a two-lap, both-directions average speed of 154.587 mph over a "flying kilometer" on the 4.71-mile oval at the DaimlerChrysler Proving Grounds here in Chelsea. The record run by the Dodge Ram SRT-10 was certified by Guinness World Records and the Sports Car Club of America (SCCA). The previous record was 147.54 mph, set last July by the Ford SVT F-150 Lightning, before the Dodge Ram SRT-10 went into production. Trevor Creed, Chrysler's Senior Vice President of Design, said: "We spent a lot of time in the wind tunnel with the Ram SRT-10, so that is why you see a deep front fascia with a splitter and a subtle rear wing. 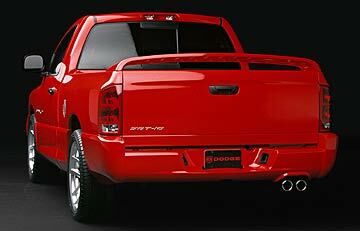 In fact, we have managed the aerodynamics of the Ram SRT-10 to give this vehicle performance more befitting a sports car than a truck. The rear wing is not only functional, providing a reduction in lift, but it also provides a reduction in drag, which is a rarity for a wing." 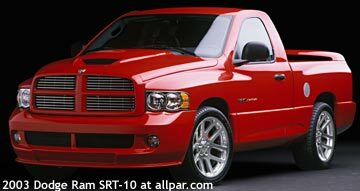 The Dodge Ram SRT-10 is available in black, red and silver only. The Ram SRT-10 rides on unique 22-inch polished aluminum "Viper-style" wheels, the largest wheels available on production pickup. The new front fascia, unique hood with integrated air intake, billet grille, lower ride height and ground-effect moldings make it look "hunkered down." From the side, effects include an aluminum fuel filler, SRT-10 badging, and visible red brake calipers; from the rear, they include a spoiler and custom fascia with cutout for dual exhausts and a large, center-mounted chrome Ram's head badge. "There is a slightly understated air about the SRT-10, especially considering its performance potential," said Rick Aneiros, Vice President, Truck Design. "But as powerful as the overall theme of the Ram SRT-10 is, we were determined not to make this another boy racer truck. We added functional aero tweaks to deliver a truck that can handle 150 mph-plus speeds." Inside, there are heavily bolstered racing-derived leather seats with black suede perforated inserts and a carbon-fiber leather trim steering wheel. Silver trim adorns the center stack and a silver trim strip with an "SRT-10" badge resides on the passenger side air bag. 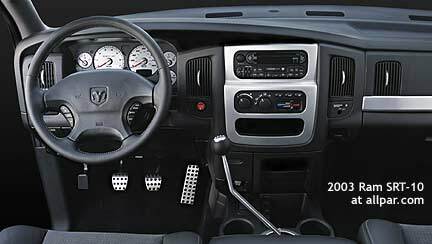 A red Viper start button on the dash goes with the engine, and a custom Hurst shift lever sprouts from a silver metal shift bezel and is topped by a Viper style shift knob. Aluminum performance pedals replace the stock set up. A new gauge cluster with satin silver-faced gauges feature Viper font and graphics and appropriately recalibrated speedometer and tachometer to accommodate the SRT-10's visceral performance. Resting on unique engine mounts, the new V-10 engine delivers 90 percent of its whopping 525 lb.-ft. of torque from 1500 to 5600 rpm. The all-new cast aluminum cylinder block has interference-fit cast-iron liners and cross-bolted main caps. Both bore and stroke have been increased over previous Viper models. Block length, block height, bore spacing, firing order, rod length and compression ratio are unchanged. The Viper V-10 includes a six main bearing crankshaft with increased stroke length and cross-bolted main bearing caps. All-new cast aluminum alloy pistons — weighing slightly less than prior years despite larger diameters — are included, as are all-new cracked-steel connecting rods that are lighter yet stronger. Cylinder heads on the Viper V-10 are redesigned using semi-permanent mold (SPM) 356 T6 aluminum alloy, with improved intake port, exhaust port and combustion chamber cooling. Lower-profile die-cast magnesium cylinder head covers with steel internal baffles and anti-slosh foam also are new for 2003. A single-piece, central dual-plenum, cast aluminum intake manifold is also new. It boasts shorter runners and a single, non-staged two-barrel throttle body for higher peak horsepower RPM. The intake manifold is an all-inclusive Integrated Air and Fuel Module (IAFM) with tubular fuel rails, injectors, sensors, wiring and throttle body — delivered assembled and pre-tested. A Ram heavy duty cooling system is modified to handle the needs of the new Viper engine. A custom dual exhaust system is mounted to new exhaust manifolds. The Ram SRT-10 also features a unique oil pan, throttle linkage, transmission mounts, exhaust manifolds, and radiator. The 2004 Dodge Ram SRT-10 focuses its power through a new Hurst shift linkage and a modified version of the Viper SRT-10's Tremec T56 six-speed manual transmission. The T56 is fully synchronized with electronic reverse lockout. A new 4.5-inch aluminum driveshaft runs to the Viper-sourced transmission and a modified differential with a Dana 80 4.11 rear axle delivers the torque to the road. The engineers at PVO modified the Ram Heavy Duty's rack-and-pinion steering and independent front suspension. Working with the fully hydroformed Dodge Ram frame, one of the stiffest in the industry, PVO added a custom tuned suspension, dropping the Ram SRT-10 one inch at the front and two inches at the rear. New front and rear strut assemblies and a rear sway bar were added to handle the increased cornering loads. "The Dodge Ram SRT-10 delivers simply phenomenal handling," said Dan Knott, Director-Performance Vehicle Operations (PVO). "But without sacrificing ride quality. This is a truck that you can run to the store in, and then start tackling apexes on your favorite set of twisties. And, depending on your right foot, the V-10 can make the straightaways really short." 0-60 mph 5.2 sec. ; 0-80 mph 8.4 sec. The Dodge Ram SRT-10's power is channeled through a Viper six-speed manual transmission that connects to a modified differential and new driveshaft. 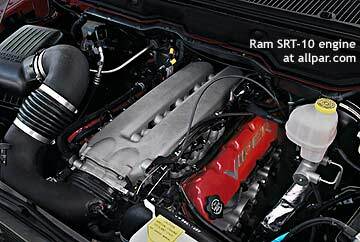 The Ram SRT-10 will accelerate to sixty mph in an estimated 5.0 seconds and deliver an estimated top speed of 150 mph. More impressively, Ram SRT-10 runs the 0-100-0 mph dash in an estimated 18 seconds. These figures beat nearly every vehicle made in the US, going back as far as you care to look. As a comparison, the Spirit R/T ran 0-60 in 5.8 seconds, and was the fastest four-door production car in the world during its time. The turbocharged, 220 horsepower Neon SRT-4 runs 0-60 in 5.9 seconds. Most "ordinary" cars run 0-60 in around 9-10 seconds now , down from 12 seconds a decade ago. Keeping all this power in check is a modified rack and pinion steering and independent front suspension from the 2002 Dodge Ram, which set new handling standards for full-size pickups. Blessed with the stiffest frame in Ram history, the Ram SRT-10 makes the most of its exclusive 24-inch wheels and 305/35 R24 high-performance tires, pulling an estimated 0.92 g's on the skid pad and hitting almost 70 mph on the slalom. A recalibrated, quick-ratio power steering unit enhances steering feel. Available in black or red only, the crisp lines of the Dodge Ram SRT-10 provide a look of machined elegance with a lower -- and an even bolder -- stance than the standard Ram. The new front fascia, hood with integrated air intake, billet grille, one-inch lower ride height and ground-effect moldings provide plenty of "hunkered down" attitude even before the ignition key is turned. From the side, Ram SRT-10 is distinguished by an aluminum fuel filler, SRT-10 badging and red Viper brake calipers visible behind the 24-inch wheels. A bed-mounted hard tonneau, spoiler and custom rear fascia with cutouts for dual exhausts provide the view for the majority of the motoring public. Inside, red-piped leather and carbon fiber-look accents complement the performance attitude established by the SRT-10's outward appearance. Silver-faced gauges with Viper font and graphics have an appropriately recalibrated speedometer and tachometer to accommodate the SRT-10's visceral performance. 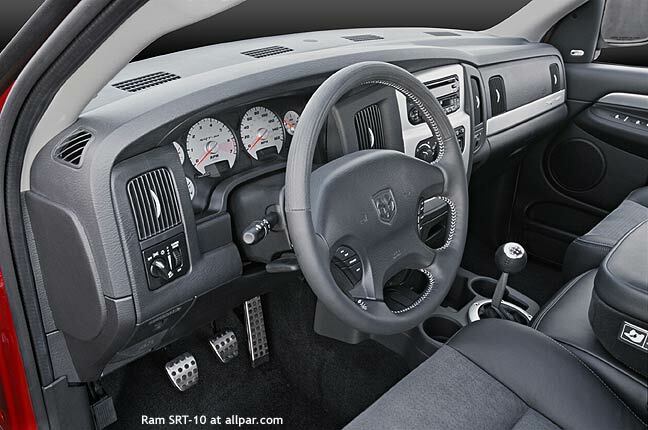 Interior space is maintained from the standard Ram. "We knew when we came out with the world's fastest production pickup that there would be customers who would want that same ultimate performance, but in a pickup that offered four-passenger seating and towing capability," said Dan Knott, Director — Street and Racing Technology (SRT). "So, the question was, 'Can we create a more usable truck for the person who wants to haul more stuff, but is not willing to give up performance?'" The engine is backed up by a four-speed automatic transmission — a 48RE gearbox, specially adapted from a diesel engine application for its ability to handle monster amounts of torque. A heavy-duty torque converter, custom transmission calibration and two-piece drive shaft were also specifically chosen for overall powertrain integrity and performance. Additionally, the Dodge Ram SRT-10 Quad Cab was fitted with a 4.56 gear ratio to improve launch feel, low-end acceleration and towing capability of up to 7,500 pounds. SRT engineers began with a fully hydroformed frame as the basis for strength and rigidity. From there, the Ram SRT-10 Quad Cab was fitted with fully-tuned front and rear strut and spring assemblies. Up front, modified steering and independent front suspension carry the load, while in the rear, axle snubbers, performance-tuned springs and Bilstein monotube shocks keep things firmly planted through the corners. Dodge chose the 2003 Chicago Auto Show to showcase their new performance truck, the Viper-powered 2004 Dodge Ram SRT-10, which the manufacturer calls "the boldest, baddest and fastest full-size pickup ever." The truck houses the highest displacement engine in a factory pickup truck--the same 8.3-liter V-10 that powers the all-new 2003 Dodge Viper. If it's power you're after, this truck sets out to deliver it, with 500 horsepower and 525 lb.-ft. of torque. The truck goes from 0 to 60 in approximately five seconds and tops out at about 150 mph. "The Dodge Ram SRT-10 may be the first halo truck, but trust me, this truck is no angel," Wolfgang Bernhard, Chief Operating Officer, Chrysler Group, told reporters. "The Ram SRT-10 is true to the performance ideals that created the original Dodge Viper: keep it simple and make it fast." The new V-10 engine delivers 90 percent of its 525 lb.-ft. of torque from 1500 to 5600 rpm. The all-new cast aluminum cylinder block has interference-fit cast-iron liners and cross-bolted main caps. Both bore and stroke have been increased over previous Viper models. Block length, block height, bore spacing, firing order, rod length and compression ratio remain the same. The Viper V-10 includes a six main bearing crankshaft with increased stroke length and cross-bolted main bearing caps. All-new cast aluminum alloy pistons weigh slightly less than prior years. New cracked-steel connecting rods are lighter, but stronger. Redesigned semi-permanent mold (SPM) 356 T6 aluminum cylinder heads, with improved intake port, exhaust port and combustion chamber cooling. Single-piece, central dual-plenum, cast aluminum intake manifold. Shorter runners and a single, non-staged two-barrel throttle body provide higher peak horsepower RPM. The intake manifold is an all-inclusive Integrated Air and Fuel Module (IAFM) with tubular fuel rails, injectors, sensors, wiring and throttle body - delivered assembled and pre-tested. The Ram has a new Hurst shift linkage and a modified version of the Viper SRT-10's Tremec T56 six-speed manual transmission. The T56 is fully synchronized with electronic reverse lockout. A new driveshaft runs to the Viper-sourced transmission and a modified differential with a 4.10 rear axle delivers the torque to the road. The SRT-10 features a fully hydroformed Dodge Ram frame, one of the stiffest in the industry, and a suspension that's been dropped one inch at the front and two inches at the rear. Also used are Bilstein shock absorbers, performance-tuned springs, 22-inch custom "Viper-style" wheels and 305/40 Pirelli Scorpion Tires. Standard ABS-equipped brakes are fitted with new 15-inch rotors on the front brakes. Rear brakes are modified Ram Heavy Duty 14-inch rotors. Front and rear brakes feature unique red calipers. The Ram's new front fascia features brake ducts to provide plenty of cooling for track sessions.